Those were apparently the last words of Major-General Max Sümmermann, Commander of 90. leichte Afrika-Division, before he died of wounds received in an air attack on 10 December 1941, during the retreat to the Gazala position. A report of the circumstances of his death is contained in the war diary of the division. He was one of the General rank officer casualties suffered by the Germans during the battle. My research has not yet extended to the Italian general officers, but if someone has the information, feel free to post it as a comment. As far as I can make out, eight German officers of general rank (ranks as of the time of battle) were based in North Africa when CRUSADER commenced on 17 November 1941. Generalmajor Karl Böttcher – Commander, Artilleriekommando 104. Generalmajor Walter Neumann-Silkow – Commander, 15.Panzerdivision. 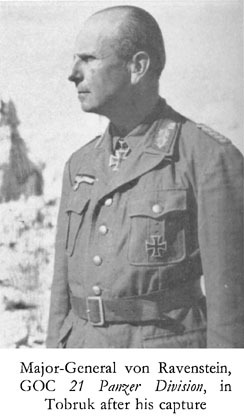 Generalmajor Johann von Ravenstein – Commander, 21.Panzerdivision. Generalmajor Max Sümmermann – Commander, 90. leichte Afrika-Division. 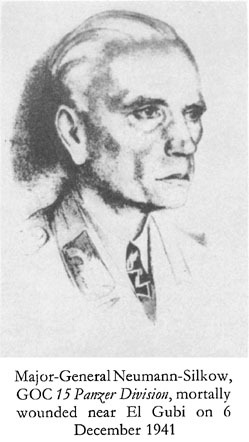 Generalmajor Arthur Schmitt – originally commander rückwärtiges Armeegebiet (army rear area) (Korück) 556, but put in charge of installations and defense of Bardia in preparation for the attack on Tobruk. Of these eight, four became casualties, and one had to report himself sick shortly after the end of operations. von Ravenstein was captured by a New Zealand patrol while on reconnaissance during the battles of Sidi Rezegh on 28 November 41. He was the first German general officer to be captured by Commonwealth forces. An article giving details of his capture can be found at this link. Neumann-Silkow died of wounds received from Commonwealth artillery fire on 6 December 1941, during the fighting around Bir el Gobi. Sümmermann died of wounds under the circumstances outlined above. Schmitt surrendered his command the fortress of Bardia with a garrison of almost 8,000 Italian and German soldiers, on 2 January 1942 to Major-General de Villiers, General Officer Commanding 2nd South African Division. He was the first German general officer to surrender such a large body of men and a city to Commonwealth forces. Gause reported sick on 18 February 42 and left Africa for a while. I believe it is arguable that the strain of the battle over the last three month played a role in this. At least three of the German generals received the Ritterkreuz (Knight’s Cross) for their role in the battle: Gause, Böttcher and Schmitt. This entry was posted in Content and tagged Axis forces, biographical. Bookmark the permalink. 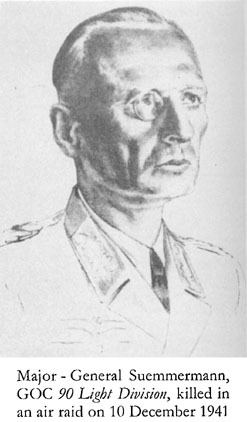 The generalmajor Böttcher was first commander of Arko 104. Planning the Tobruk’s assault, he was put in charge of a Gruppe Böttcher in the Belhammed Zaafran area (this Gruppe was mainly around Arko 104’s units). After the beginning of the battle, Böttcher fought hard against the attack of british armoured forces in the Sidi Rezegh sector, and against attacks from the Tobruk’s garnison at El Duda. The Heavy artillery was taken between two fires ! Protected only by some infantry battalions from 90. Leichte-afrika-division. A new Kampfgruppe Böttcher was formed the 24th of november with Schützen-regiment 155, verstärk-Afrika-regiment 361 and Pionier-Battalion 900 from 90. Leichte – Afrika-division. This Kampfgruppe has also the Arko 104, under Oberst Mickl. After a very successfull action, Böttcher was named the 30th of november 41 by Rommel to command the 21. Panzer-division, to replace von Ravenstein captured. artilleryman, knowing nothing of Panzer, Böttcher prove himself very bad in this new command, and will be replaced by generalmajor Georg von Bismarck the 30th of january 1942. I believe Böttcher received the RK on 13 Dec. 41, in which case it can really only have been for the role he played as commander of Arko 104 during CRUSADER. Balsi (of the site above) does not have the award certificate, but Boettcher only took over the division on 1 or 2 December, and from all accounts his performance was not that great, making it unlikely that he was awarded the RK for his role as divisional commander. Many thanks for the additional info!